Which Option is the Best for You? We get the question all the time. What are the benefits of completing either Driver Improvement or Driver’s Ed online vs. in a classroom setting? Aside from the obvious price differences, each method of completing your instruction has its own pros and cons. In today’s tech savvy world, many would jump at the opportunity to complete their work online, from practically anywhere and on their own time. Some may not have the patience to sit in a classroom environment, stirring up memories of their school years. Others may have scheduling conflicts, and can’t dedicate the time. Then there are those that like to work at their own pace, taking notes and absorbing information without the feeling of being rushed. These are just a few of the positives, obviously there are many more. Even though you are able to complete the instructional modules at a time and place of your choosing, you will still have to visit an approved testing facility to complete your final exam (fortunately, we offer a convenient location to do so). In addition, you are at the mercy of a solid internet connection, which means either being connected via an Ethernet cable or connected to a strong wifi signal. Furthermore, you may encounter along the way technical issues or page errors. The vendors we work with offer great technical support, but if the issue is with your device or browser, there’s only so much they will be able to do. The greatest benefit here is that you get the personal coaching and examples of an experienced instructor. The monotony is broken in that there are real-life examples, question and answer segments, role play, etc to ensure the knowledge sticks. Additionally, you have the opportunities to ask questions and solicit feedback from you instructor and your peers. Many jump at the opportunity to partake in classroom instruction for this reason alone. Additionally, you receive printed material that you can keep and review at a later time, as well as to help prepare you for your final exam. While many prefer the social interaction with others in a classroom setting, some prefer to work alone. Understandable. Again, there is the scheduling concern. With Driver Improvement, one has to dedicate eight-plus hours of a Saturday to attend and complete. With Driver’s Ed, you’re looking at numerous days depending on your age and the time of year (those under 18-years old have restrictions on the number of hours per day they can participate). Lastly, some may struggle with the pace of instruction. There’s no question some are what you would call fast learners, while others prefer to take their time and absorb the information. While our instructors do their best to accommodate everyone’s learning style, we can’t make everyone happy by either slowing down for some and speeding up for others. So there you have it. 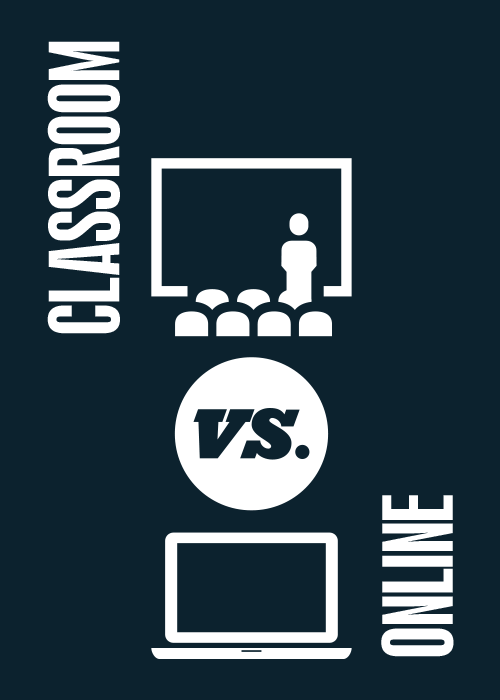 A short rundown on the pros and cons of online instruction vs. classroom instruction. At 2020 Driving School, we gladly offer both types for Driver Improvement and Driver’s Education, giving you options for the method you prefer. If you have any questions or would like more details, don’t hesitate to contact us.